When it comes to legendary 1980's cinema, you can't do any better than The Running Man. Dystopian future meets gory game show meets Arnold Schwarzenegger. Damn... it's just so good! But did you know that you can have that same feel at your gaming table? 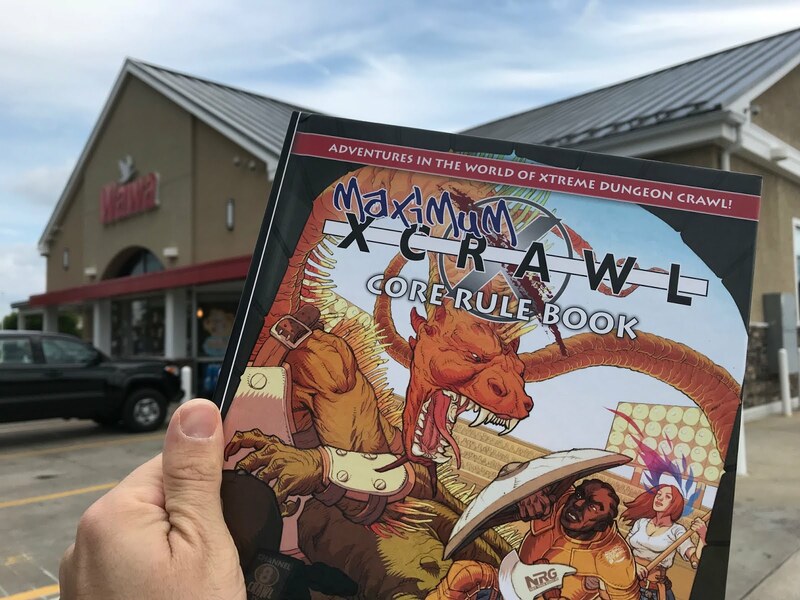 Well, if you are a Dungeon Crawl Classics gamer, I'm sure you know all about Brendan LaSalle's Xcrawl! 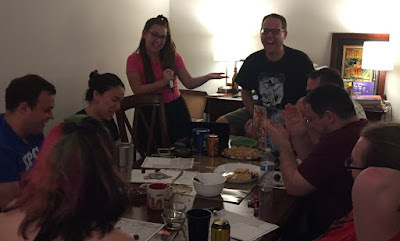 I fell in love with the Xcrawl universe after running Dungeonbattle Brooklyn as a fund-raising event for Lawful Good Gaming. Putting on my best Richard Dawson impersonation, microphone in hand I ran my players through a invigorating evening of deadly game-show antics! Ever since, I've had the itch to run more Xcrawl, and perhaps even write my own Dungeonbattle. 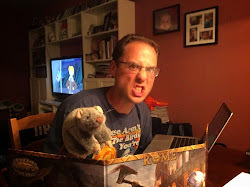 I really wanted to run Dungeonbattle Brooklyn for some of my friends here in the Philly area, but I thought that a 0-level funnel would be easier to start them into the world of Dungeon Crawl Classics. But there aren't any 0-level funnels for Xcrawl on the market. I needed to make one. The game takes place 1d3 years from now. So right now its 2018, which means the adventure takes place between 2019-2021. Just roll. Whatever year you roll, whatever outlandish newfangled technology you think is going to exist by then (iPhone XV, Gluten Eradication Rays, Universal Healthcare), go ahead and give it a 1980's spin. I mean, its the future, but just a future that would've been imagined in 1988. Go watch Total Recall if you need some help. Or Road House. Replace Emperor Reagan with Emperor Drumpf. I mean... it's pretty much the way things are headed, right? Players who show up to the table eating food that is clearly from Wawa gain 1d3 points of Luck. Dungeonbattle Delco is a zero-level or first level adventure set in the Xcrawl universe. 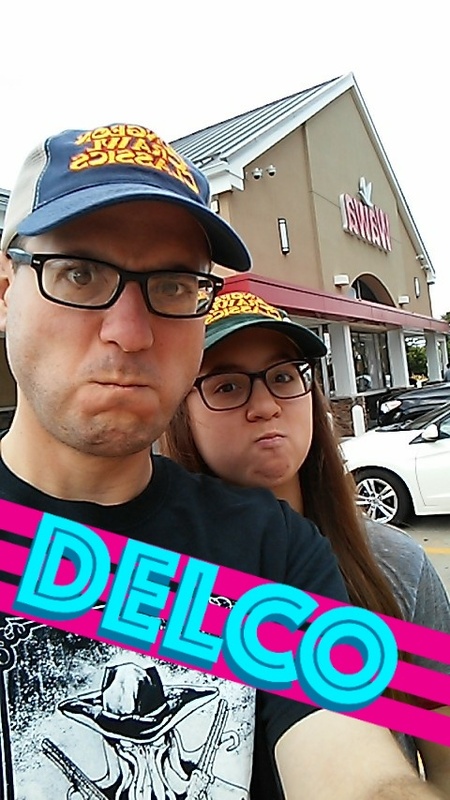 For those unfamiliar with the term, "Delco" is short for Delaware County, located just southwest of Philadelphia. It just so happens that this is where our family moved a couple of months back, and we are acclimating to the area and learning all the lingo (and the accent!). What better way to fulling immerse ourselves in the region than by setting our next adventure right here! To make this Dungeonbattle a fully Philly experience, I decided to throw in a ton of local references. Feel free to use what I've got here, or toss in some of your own favorite hometown features. Dungeonbattle Delco, also known as the "First Annual Wawa Classic Hoagie Classic", is a Division IV, non-lethal event that takes place in the brand new Xcrawl Semi-Pro Event Center (XSPEC) in the Springfield Mall next to the Target. DJ (Dungeon Judge) Pat Fiorino, a prominent Philly native and popular restaurateur, opened the Dungeonbattle Delco recently as both a sporting complex and dinner theater. Kind of like a Medieval Times, but with much more violence. DJ Pat dreams of running Division III, full-lethal events at the Springfield Mall, but for the time being he's only sanctioned to run amateur, college, and semi-pro level Xcrawl events. The Xcrawl complex has done well over the last few months, and DJ Pat saw an opportunity to really kick the experience up a notch with outside corporate sponsorship. Wawa, and to a much lesser extent Scott Kia of Springfield, have all teamed up with DJ Pat to make the First Annual Wawa Classic Hoagie Classic the best Division IV non-lethal event ever. If all goes well, perhaps the Second Annual Wawa Classic Hoagie Classic will be full-lethal! Fair warning: I'm going a little crazy with what I'll be allowing in this Xcrawl campaign. I wanted to use not only the core DCC classes, but also the Mutant and Manimal from Mutant Crawl Classics and the Athlete form the Goodman Games Gen Con 2016 Program Guide. All characters roll for both occupation and race. 4 Halfling As per DCC Corebook or Crawl! 9 Elf As per DCC Corebook or Crawl! As per the original Xcrawl rules, every player should choose an actor or actress to play their character in the game. Should the player choose a famous actor from the Philadelphia area, they get +1 Luck. Should they pick Bradley Cooper they get +2 Luck. Don't tell the players about this until after they've all selected their characters. Also, it only counts before anyone knows the rules. But if someone thinks that they can game the system, and finds out about this prior to the adventure (spoiler alert not given), they get -1 Luck. -1d7 Luck if they try to pick Sylvester Stallone hoping to game the system. Stallone may have been Rocky, but he's from New York. DJ Pat and the sponsors for the Springfield Mall XSPEC event have collaborated in coming up with fun and exciting rules for this event, even if there would be no "planned" lethality. It should be noted that the event is nonlethal for both PC's and NPC's, and that includes any Kobolds. Killing of anyone will involve in immediate disqualification. Splash Zones: DJ Pat's event maximizes the use of water elements called "Splash Zones." Should a PC find themselves submerged in a splash zone they have a 1 round to remove themselves (typically a DC 10 Strength check to climb out) or they will be disqualified. Zero level characters are out of the event. 1st level characters can return to the next area so long as the team makes it through. Commercial Breaks: For my event, I prepared a list of great commercials to show on YouTube. I was inspired by Judge Michael Bolam's use of a commercial break at Gen Con. If you want to use my commercials, here you go. Just follow that link and enjoy! For best effect, run 3 commercials after each Area. Sorry, this is as good as I get with mapping. After field reporter Katie Lynn interviews the PC's in the green room, its time to get started. The adventurers walk into a 100' by 50' arena, surrounded by spectators eating their dinners. That's right, it's dinner theater time! A miniature castle is situated on the far end of the chamber. This opening scene separates the heroes and monsters from the spectators by just a thin net. Fortunately, there's not much danger ahead, but a lot of opportunities to test some basic skills. Before the scene, DJ Pat accounts the PC's, and thanks the Media, PA based Media DelKobold Club for creating this very first challenge. He also reminds everyone that this is a non-lethal event, and that goes for the DelKobolds as well. A small troupe of DelKobolds defend the miniature castle on the far end of the room. Unlike typical Kobolds, DelKobolds are shorter, feistier, and capable of hurling vicious insults. They specialize in guilt trips. DelKobold: Init +2; Atk club (+0 melee, 1d4 dmg) or sling (+1 ranged, 1d4 dmg); AC 12; HD 1d4; MV 20; Act 1d20; SP infravision 100'; SV Fort -2; Ref +1; Will -2; AL N.
DelKobold Boss: As DelKobold, but with 3d4 HP. There are 3 tiers to the castle, each approximately 5' high. So the top is only 15' off the ground. A buzzer is at the top, guarded by the boss. On the second tier are 4 of the DelKobolds armed with clubs. On the third tier (closest to the ground, are another 4 DelKobolds. The PC's start unarmed, and unarmored. The goal of the room is to make it to the top of the castle, and hit a buzzer. This opens a door in the side of Kobold Alley, to break room and another pair of doors, one to Area 2, the other to Area 3. In the break area, the PC's can select a club, staff, or Nerf Bow if they haven't grabbed one already. They also get a Wawa iced latte that heals 2d5 HP when they drink it. Much like the famous TV show Climbing for Dollars, Hang the Soul requires a great bit of hanging... and climbing. It also features really angry bats! The room is a 50' wide, circular chamber, with a pit of wooder (water) at the bottom. A small ramp leads the PC's to a series of 10 ropes. At the top of the 40' high chamber there is an Xcrawl Edition Kia Soul hanging from the ceiling. The goal of the Area is to climb up the ropes and get into the car, turning the ignition. The first to succeed wins the car. This sounds easier than it is. To get to the car requires 2 DC 5 climbing checks up the rope. Failure means falling into the water below, which could be a disqualification (although getting out of the water is pretty easy, given that the ropes are dangling above, only a DC 5). Once a PC reaches the Kia Soul, a whole mess of endorsement covered bats fly out from above the vehicle, harassing the PC's. Treat as a Bat Swarm from the DCC rulebook, page 396. First person to startle the bats needs to make a DC 12 Will save. Attacking the bat swarm is hard while climbing ropes. -1d to any attacks with one handed melee weapons. Using a two handed weapon is next to impossible (-3d). Once in the car, the PC's need to find the key fob. They can look in any area of the car that they want, each search requiring an action. Keep things in initiative order. The key fob is located behind the left passenger seat, taped to the upholstery. After 2 rounds of searching, the car will immediately drop into the water below, and will start flooding with water. Note: There could be random sweet swag at the bottom of the water. The PC's will need to act quickly. After another 2 rounds the car is flooded, and the players are at risk of drowning! Fortunately there are scuba diving dolphin manimals who can assist before anyone dies, but being saved by scuba dolphins means disqualification). First PC to turn the ignition wins the car! The PC's face a chasm with a great, bubbling river running down the middle. Immediately across the chasm, the PC's see another door. Unfortunately the gap is over 30' away. There are several raised platforms in the room as well, each holding wonderful prizes! Unfortunately, a great mutated calamari slime lurks in the river, and it is quite irate. First let's talk about the two raised platforms. Each is 20' high, greased with olive oil, and very hard to climb (DC 20 without some kind of assistance). The check is required for both the climb up and the climb down, and falling is a serious risk. The northern platform has a front loading washer/dryer combo from Best Buy. The southern platform has a six-pack of Wawa brand Healing Seltzers (1d6 HP). The doorway leading out of the chamber is also raised, but not greased. It's just a DC 10 to climb up. The river is quick moving, but situated in the center is the great calamari slime. Anyone entering the 10' river will be attacked by the slime's tentacles automatically. Battling the slime is difficult, but possible. Crossing the river without attacking the slime would be easiest, but requires some kind of teamwork. Just a really nice place to take a quick break and win some fabulous prizes! Katie Lynn shows up and interviews each of the PC's to see how they are enjoying the events so far. Also, they are asked if they want to say hello to anyone back home on the AVS (arcane video screen). Once the pleasantries are done, there is a word from the sponsor, and then the PC's get to choose to open one door each (or opt not to). Door #1: a hot Wawa chicken sandwich, served by an irate Wawa clerk who wanted to be on the show. Her name's Tina. When the character tries to take the sandwich, she punches him in the face (Atk +2, she's strong! 1d3 damage). She's kicked out of the show, but the damage remains. The sandwich grants 1d5 hit points. Door #2: $500 in cash! Door #4: $500 of free play at Harrah's Casino Philadelphia in Chester. Door #5: Trap! It looks like a gift wrapped box from Hot Topic, but when the PC tries to open it, they find that it's an explosive filled with thumbtacks! DC 10 Reflex save, or everyone behind the door (Katie Lynn is not standing nearby) takes 1d3 damage. Door #6: Free Wawa Coffee for a whole friggin' year! Door #7: Looks like a barrel of pickles, but actually a barrel of giant rats! 2d4 Giant Rats appear, out of the DCC rulebook, page 424. Door #8: A Sam's Club. Great club (2 handed) that causes 1d10 damage, but is covered in corporate logos. ... well not "die" as this is non-lethal, but pretty much the closest thing. When the PC's first get in this area they are required to take their shoes or boots off and put on ice-skates. Skating to the other side of the chamber requires a trio of Agility rolls, at an easy DC of 5. Pretty simple right? Failure moves the PC one step towards the center. It should be noted that a PC has only 2 failures allowed before they fall down into the middle chamber. So essentially, the player gets to make as many rolls as they want, needs to get 3 successes, and can't have 3 failures. Super easy. For a DC 15 check, a PC can attempt to skate straight towards the hole, and then fly up the other side. Let's add skating Slushdroids. Essentially slushy covered bots that come out of the walls on skates. One slushdroid appears for every 2 PC's on the ice. PC's actively engaged in combat with a Slushdroid must make their Agility checks for skating at a DC 10 (not 5). A PC that falls into the central hole is disqualified from the event or area (depending on if they are 0 or 1st level.) They simply drop into a big cushion, and are interviewed by Katie Lynn who appears. Once on the other side, the PC's may realize that they still have their skates on. If they don't, don't tell them. The first PC to the other side wins a free 1 week vacation in the Poconos, where they will get a hotel room with a wine glass Jacuzzi, and a private concert featuring Boyz 2 Men. Remaining PC's who make it across wins $150. The final chamber! Here, the PC's will face off against Super Bowl LII champion and 2nd level wizard Nick Foles! The party enters through a doorway into a big square room, 60' across. On the northern end is what looks to be a cave. There are onlookers all about, watching through glass walls. This is totally right out of the Colosseum from Best of the Best 2. Most notably, there is a Gnome watching on a pedestal, standing next to DJ Pat, holding a wand. DJ Pat announces the final chamber as the Lair of the Eagle, and everyone starts to cheer. A four (4) pro-wrestler looking orcs (DCC rulebook, page 423) emerge from the dark cave, followed by Nick Foles! Nick Foles is wearing a Philadelphia Eagles Wizard's Robe, and is clutching a staff with a football on top. Here's the deal: the floor in this chamber is partially illusion, but also partially solid, with a watery pool underneath. Rather than picking which parts of the floor ahead of time, Gnome gets an action during combat to open up 2d8 5' segements of floor each round. The Gnome always goes first. You're going to want to map this out for your players, and miniatures or tokens may be helpful. Oh, if the PC's still have those skates on, they roll 1d16's for everything (-1d) until they come off. That takes an action. Hard to walk in skates! If they don't specifically mention taking them off, they haven't taken them off. The orcs are unarmed, and will always try to do opposed strength checks to push PC's into the watery openings, or just pin them. If the PC's are 1st level, add 2 orcs and give them clubs. Atk football staff +2 melee (1d7+1 dmg) - possible prize! Once Nick Foles and the rest of the orcs are either unconscious or in the water, DJ Pat announces the victory! Time for prizes! At the end of the adventure, for a special touch, have Wayne Brady show up as a celebrity to give out the prizes. 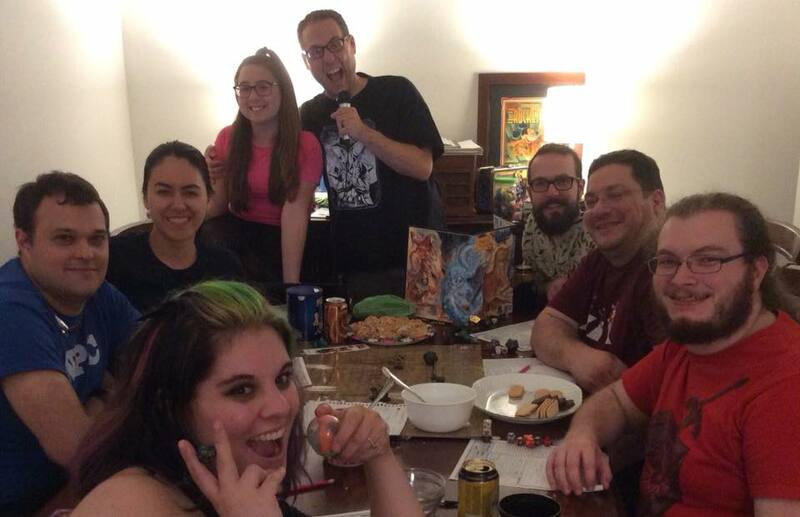 I ran Dungeonbattle Delco as our very first role-playing event in our new apartment in Glen Mills, PA. It had been just over two months since moving in, and it was about time for us to roll some dice. We had six wonderful players, a terrific mix of folks I've played with for years, and new friends that we've just met in recent months here in the Philly area. If I had any takeaways from running the game, it was how competitive the group was during certain scenes. They really fought for that Kia Soul! Hats off to Judge Evie for doing an EXCELLENT job playing Katie Lynn, the field commentator for the Dungeonbattle. Her Philly accent was awesome!